When I posted my Sticky Garlic Chicken Wings last April it was a big hit, it was favourited 1000+ times and view 2000+ times in Foodgawker in a day (at the time of this writing) and now one of the popular recipes in this blog. 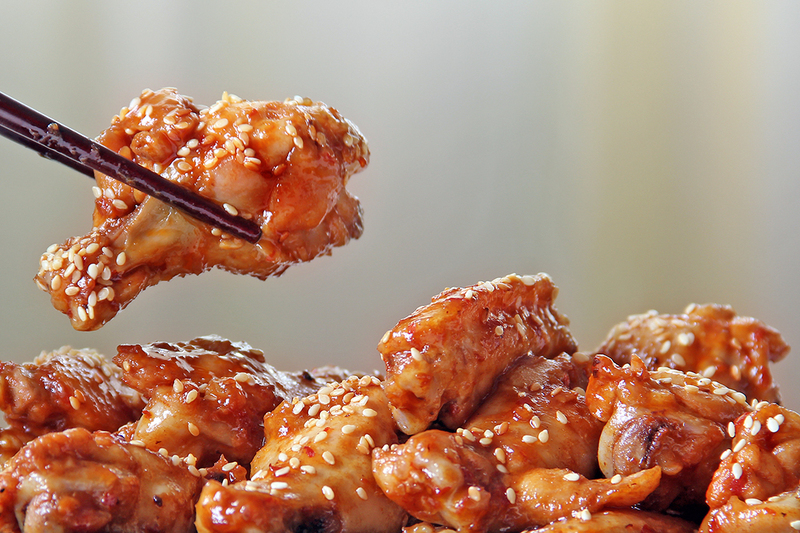 Now I am posting another chicken recipe which will have the same potential and it is called the Chilli Sesame Chicken Wings, it has nearly the same cooking method but this time the flavours infused in the chicken is chilli, garlic, sesame and honey. It will definitely a big hit to those who loves thing a little bit hot! In a bowl mix together honey, light soy sauce, chilli garlic sauce, garlic cloves and lemon juice. Add chicken pieces and marinate for at least 8 hours. In a wok add the chicken together with the marinade and 1 cup of water, cook over medium-high heat turning the chicken pieces on the other side once in a while until liquid is reduced (around 15 minutes). Add sesame oil and stir fry for 2 minutes. Sprinkle toasted sesame seeds on top then serve. These look wonderful — love the photo! Gorgeous photo and delicious looking wings! Uhmm have you been living in my brain!? I have been DYING to have that. Great photo! And the recipe looks darn good too. 2000+ views in FoodGawker in one day? That’s really good. But well deserved. Oh you know the sticky garlic chicken is a winner around here. It’s on our menu weekly. Seriously. This will be a nice change-up. Wonder what the kids will think! Have never attempted this in a wok: now when is the next meal? 🙂 ! Fascinated, and love the late sesame oil addition! will definitely be a big hit with hubs… you have all the ingredients that he loves… san mig beer will come handy. I missed your Sticky Garlic wings from April so thanks for linking to those. Both of these recipes look finger-licking good! Going to be pin this one! DEFINITELY a keeper! I also remember your Sticky Garlic Chicken Wings. Congratulations on your successful recipe/post! This will be popular without a doubt! Looks yum! I loved those sticky garlic wings 🙂 They were delish. I’ll have to give the chili sesame version a shot! Where can I buy chilli garlic sauce from or what else may it be called at the shops? I remember those wings – and these are divine!!! I made these and both my husband and I wished I had doubled the recipe. So good. Making it again tonight! Delicious and easy! Recipe is a definite keeper. Used regular soy sauce (that’s what was in my pantry) and was a bit salty. So light soy sauce (as the ingrediants called for) is a must! Thanks!! !